The journey along Dublin's main O'Connell Street onto Parnell Street was an uphill struggle against battering winds and heavy rain made all the worse by the fact that I was trying to hold up an umbrella. While the end of my journey brought some physical comfort away from the atrocious weather it would not give much in the way of psychological consolation as I was to collect my husband's recently deceased aunt's Death Certificate from her family doctor. Another stark reminder of her passing. 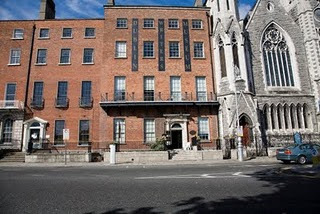 Around the corner from the doctor's surgery stands the Dublin Writers Museum which many years ago was my old School of Commerce and Retail Distribution. There's also a wonderful little cafe in there so it's to it I headed for a much needed cup of Camomile tea (I bring my own everywhere and just ask for boiling water!) and some relaxation. While sipping my warm brew I began to remember moments from my time as a teenager in that building. Apart from the usual classroom memories my most vivid recollection is the sound of our footsteps thundering down the stone steps to the kitchen where lunch was eaten seated on benches at long wooden tables. I clearly remember shiny tiled walls, huge sparkling stainless steel containers and the kitchen ladies who wore white coats and hair nets. As I was leaving the museum I glanced into two of the ground floor rooms where once I was taught English, Maths and Book-Keeping (the latter two holding no great appeal for me!). 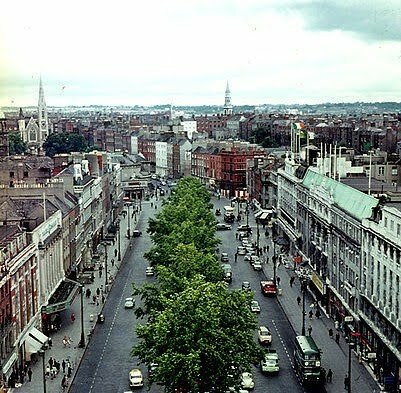 From there I headed, a few doors down, to The Hugh Lane Gallery where, as a student of the aforementioned school, my chums and I would sometimes visit usually on wet days. Our knowledge of the fine arts was of course next to nothing but I did enjoy getting lost in some of the classic pieces. It was also a great place to sit quietly and finish off your homework that you should have had done for the afternoon! Forty plus years on the gallery is much brighter, the old paintings still hang on its walls along with the many collections acquired over that time period. 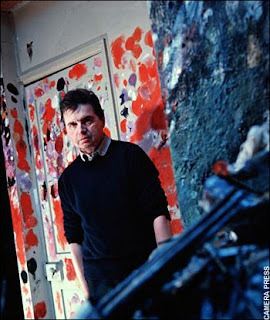 While there I decided to visit the Francis Bacon Exhibition which is on view until March 2010. I've always been fascinated by artists whose works have been hugely influenced by their tortured lives. Francis Bacon was one such man. Out of all the pieces from the exhibition the one that touched me deeply was his studio which has been donated to the Hugh Lane Gallery and contains its entire contents from South Kensington, London. It's very cleverly done in that you feel you are actually stepping into the studio while in fact the only thing that separates you from the room is a glass doorway. Immediately I felt as if I were walking in uninvited into somebody's living room while they were out. I was trespassing. Gazing in almost disbelief at the arrangement of the items as they would have looked in the London studio I realised that in my sense of awe I was holding my breath. Having first felt that I shouldn't really be there I then went on to find it difficult to leave, almost as if I didn't want to abandon the artist to his chaos. I finally left the gallery feeling spiritually enriched by my experience. 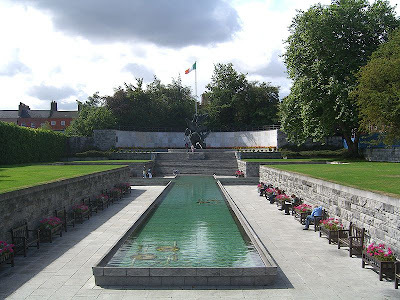 The final leg of my journey of comfort then took me across the road to the Garden of Remembrance, a memorial to the people who gave their lives for Irish freedom in 1916. I was a student at the college opposite when this garden was first opened in 1966 by our then president, the late Eamon de Valera. It was a great place to spend lunch time especially when the weather was sunny as we'd eat our sandwiches on one of the garden seats then set about once again catching up on left-over homework. We only ever got caught once doing it and that was when the geezer from the art gallery reported us to the school for which we were then hauled up to the principal's office to face the music. Whoever said schooldays were the best days of your life must have also had fun trying to get one over on the teachers! Great times! Another well written piece with great pictures to help us imagine the scene. Its a long wait between post but your stories are worth the wait. Thanks Donald, it is amazing how sometimes returning to an old haunt can bring a great sense of comfort. Will try to put pen to paper (God be with the days!) sooner! Cheers. Thank you mp3 downloads, I enjoyed your blog also, nice lyric reference point. Cheers. Thank you so much C for your lovely comment. I love my city but sadly like everywhere else they're replacing the old beautiful buildings with some eyesores to say the least. Perhaps one good outcome of this recession might be that lack of finances might save our historic places. Your blog is wonderful with a beautiful layout. I've truly enjoyed reading your poetry. Thanks for your visit. Cheers.